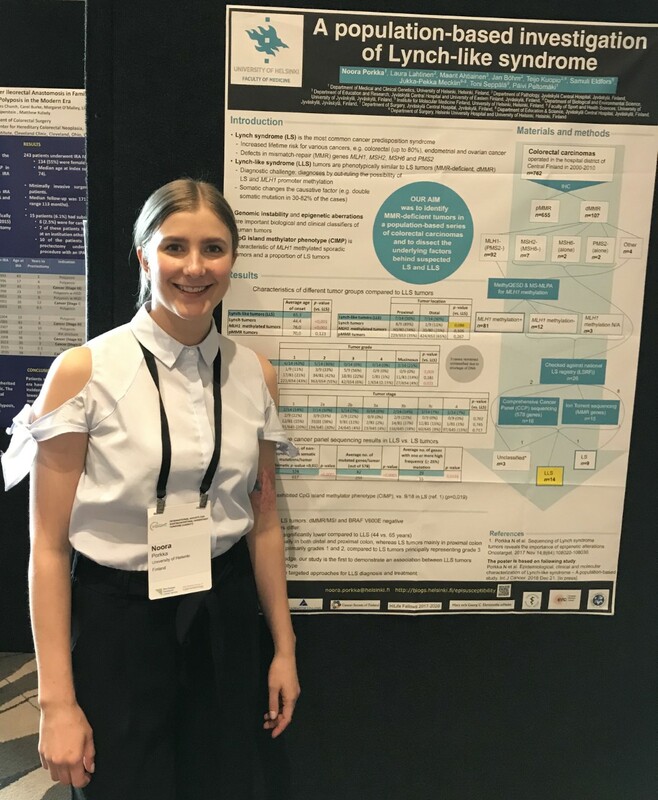 The 7th biennial International Society for Gastrointestinal Hereditary tumors Incorporated (InSIGHT) meeting was organized in Auckland, New Zealand on 20-23rd of March. 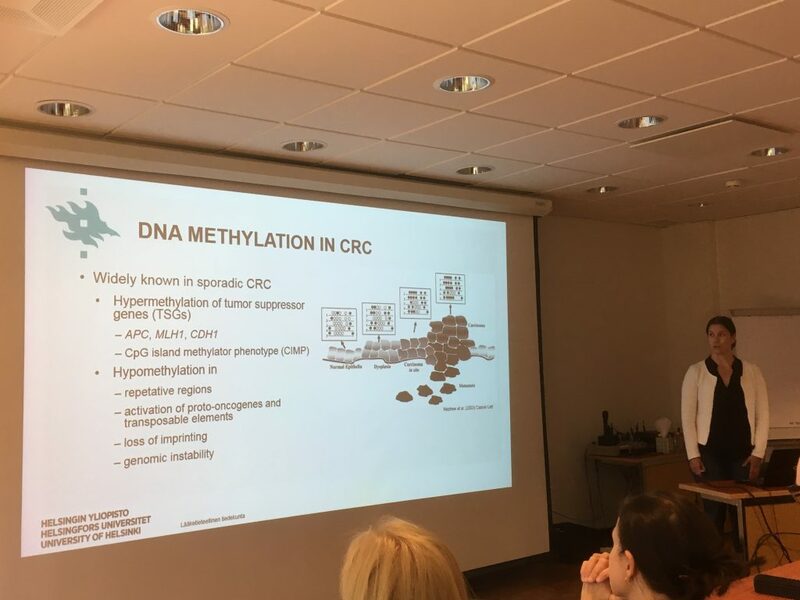 Olkinuora A, Nieminen TT, Mårtensson E, Rohlin A, Ristimäki A, Koskenvuo L, Lepistö A, Swedish Extended Genetic Analysis of Colorectal Neoplasia (SWEN) Study Group, Gebre-Medhin S, Nordling M, Peltomäki P.
METHODS: Exome sequencing was conducted on 40 unexplained (mainly sporadic) cases with FAP or AFAP from Finland. 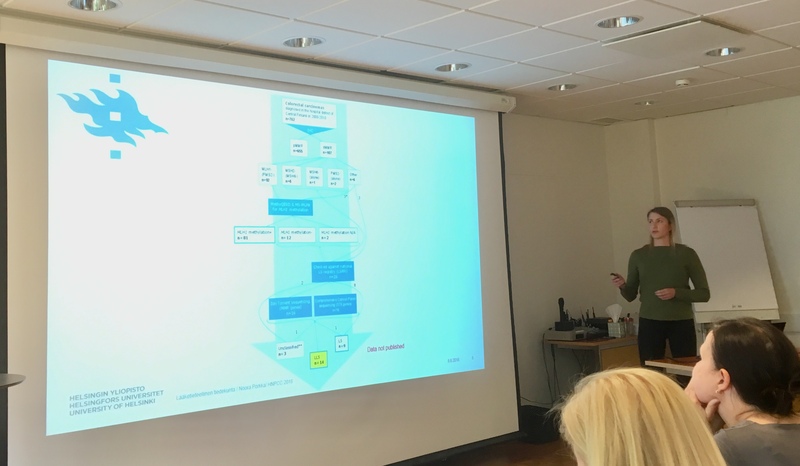 The DNA mismatch repair (MMR) gene MLH3 (MutL Homolog 3) was pinpointed and prompted a subsequent screen of ~1000 Swedish patients referred to clinical panel sequencing for colon tumor susceptibility. RESULTS: Three homozygous carriers of a truncating variant in MLH3, c.3563C>G, p.Ser1188Ter, were identified among the index cases from the Finnish series. An additional biallelic carrier of the same variant was present in the Swedish series. All four patients shared a 0.8-Mb core haplotype around MLH3, suggesting a founder variant. Colorectal polyps from variant carriers showed no instability at mono-, di-, tri-, or tetranucleotide repeats, in agreement with previous findings of a minor role of MLH3 in MMR. Multiple loci were affected by loss of heterozygosity, suggesting chromosomal instability. CONCLUSION: Our results show that a biallelic nonsense variant of MLH3 underlies a novel syndrome with susceptibility to classical or attenuated adenomatous polyposis and possibly extracolonic tumors, including breast cancer. Colorectal carcinomas that are mismatch repair (MMR)‐deficient in the absence of MLH1 promoter methylation or germline mutations represent Lynch‐like syndrome (LLS). Double somatic events inactivating MMR genes are involved in the etiology of LLS tumors. Our purpose was to define the clinical and broader molecular hallmarks of LLS tumors and the population incidence of LLS, which remain poorly characterized. We investigated 762 consecutive colorectal carcinomas operated in Central Finland in 2000 – 2010. LLS cases were identified by a stepwise protocol based on MMR protein expression, MLH1 methylation, and MMR gene mutation status. LLS tumors were profiled for CpG Island Methylator Phenotype (CIMP) and somatic mutations in 578 cancer‐relevant genes. Among 107 MMR‐deficient tumors, 81 (76%) were attributable to MLH1 promoter methylation and 9 (8%) to germline mutations (Lynch syndrome, LS), leaving 14 LLS cases (13%) (3 remained unclassified). LLS carcinomas were diagnosed at a mean age of 65 years (vs. 44 years in LS, p < 0.001), had a proximal to distal ratio of 1:1, and all were BRAF V600E‐negative. Two somatic events in MMR genes were identifiable in 11 tumors (79%). As novel findings, the tumors contained an average of 31 nonsynonymous somatic mutations/Mb and 13/14 were CIMP‐positive. In conclusion, we establish the epidemiological, clinical, and molecular characteristics of LLS in a population‐based study design. Significantly more frequent CIMP‐positivity and lower rates of somatic mutations make a distinction to LS. The absence of BRAF V600E mutation separates LLS colorectal carcinomas from MLH1‐methylated colorectal carcinomas with CIMP‐positive phenotype. 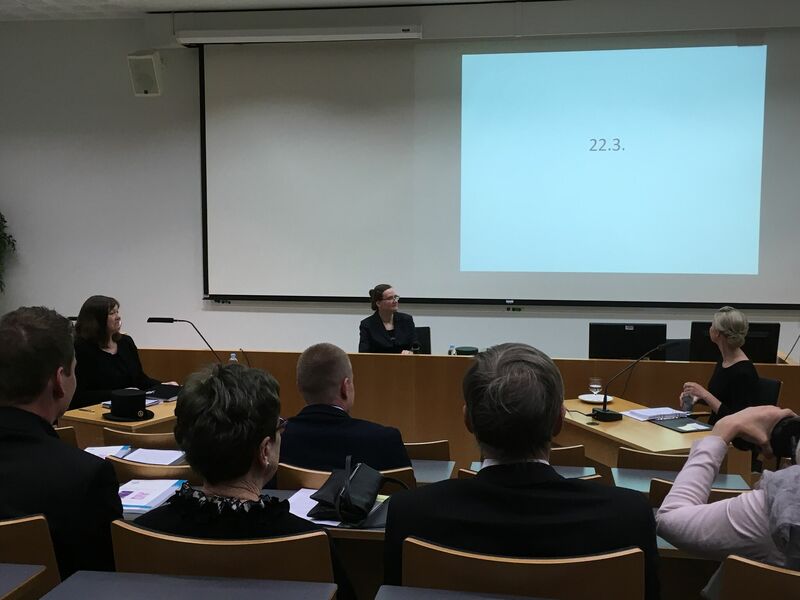 Satu Mäki-Nevala, Satu Valo, Ari Ristimäki, Virinder Sarhadi, Sakari Knuutila, Minna Nyström, Laura Renkonen-Sinisalo, Anna Lepistö, Jukka-Pekka Mecklin, Päivi Peltomäki. Background: DNA mismatch repair (MMR) defects are a major factor in colorectal tumorigenesis in Lynch syndrome (LS) and 15% of sporadic cases. Some adenomas from carriers of inherited MMR gene mutations have intact MMR protein expression implying other mechanisms accelerating tumorigenesis. We determined roles of DNA methylation changes and somatic mutations in cancer-associated genes as tumorigenic events in LS-associated colorectal adenomas with intact MMR.Methods: We investigated 122 archival colorectal specimens of normal mucosae, adenomas and carcinomas from 57 LS patients. MMR-deficient (MMR-D, n = 49) and MMR-proficient (MMR-P, n = 18) adenomas were of particular interest and were interrogated by methylation-specific multiplex ligation-dependent probe amplification and Ion Torrent sequencing.Findings: Promoter methylation of CpG island methylator phenotype (CIMP)-associated marker genes and selected colorectal cancer (CRC)-associated tumor suppressor genes (TSGs) increased and LINE-1 methylation decreased from normal mucosa to MMR-P adenomas to MMR-D adenomas. Methylation differences were statistically significant when either adenoma group was compared with normal mucosa, but not between MMR-P and MMR-D adenomas. Significantly increased methylation was found in multiple CIMP marker genes (IGF2, NEUROG1, CRABP1, and CDKN2A) and TSGs (SFRP1 and SFRP2) in MMR-P adenomas already. Furthermore, certain CRC-associated somatic mutations, such as KRAS, were prevalent in MMR-P adenomas. Interpretation: We conclude that DNA methylation changes and somatic mutations of cancer-associated genes might serve as an alternative pathway accelerating LS-associated tumorigenesis in the presence of proficient MMR. 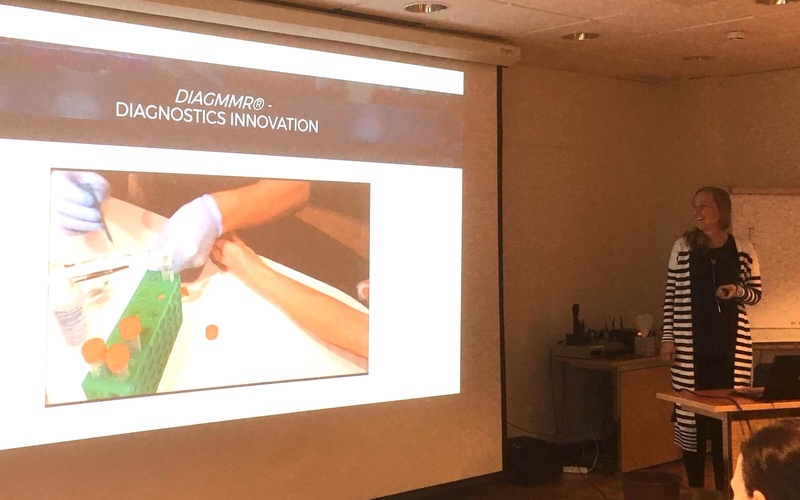 The Annual Meeting of the Finnish collaborative HNPCC reseach groups was organized in Haikko, Porvoo on 9th of June 2018. 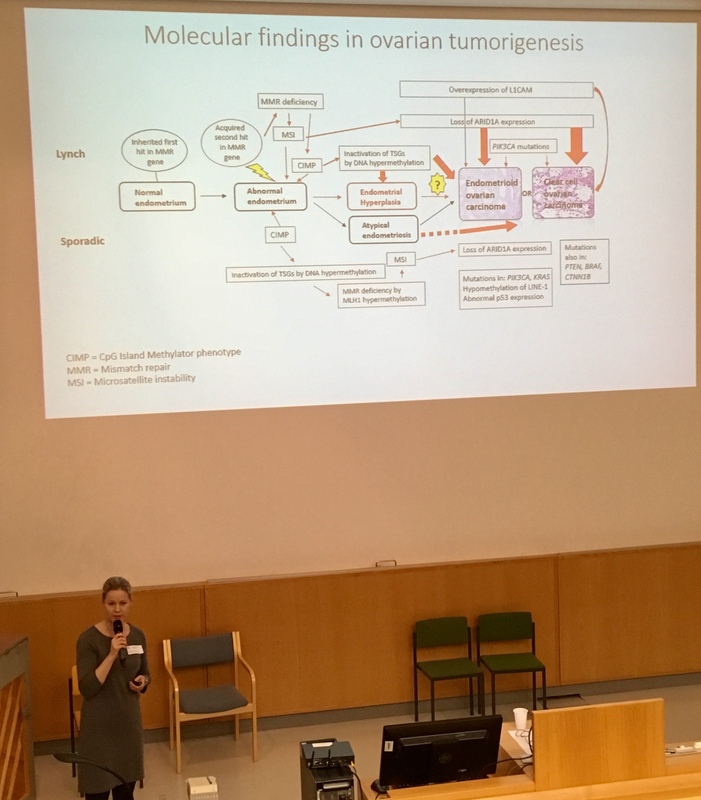 Prof. Päivi Pelomäki gave an overview of the on-going research projects including an overview of the current status of the collaborative project initiated together with Prof. Jukka-Pekka Mecklin and Prof. Minna Nyström funded by Jane and Aatos Erkko Foundation in aim to recognize molecular mechanisms of colon cancer susceptibility. 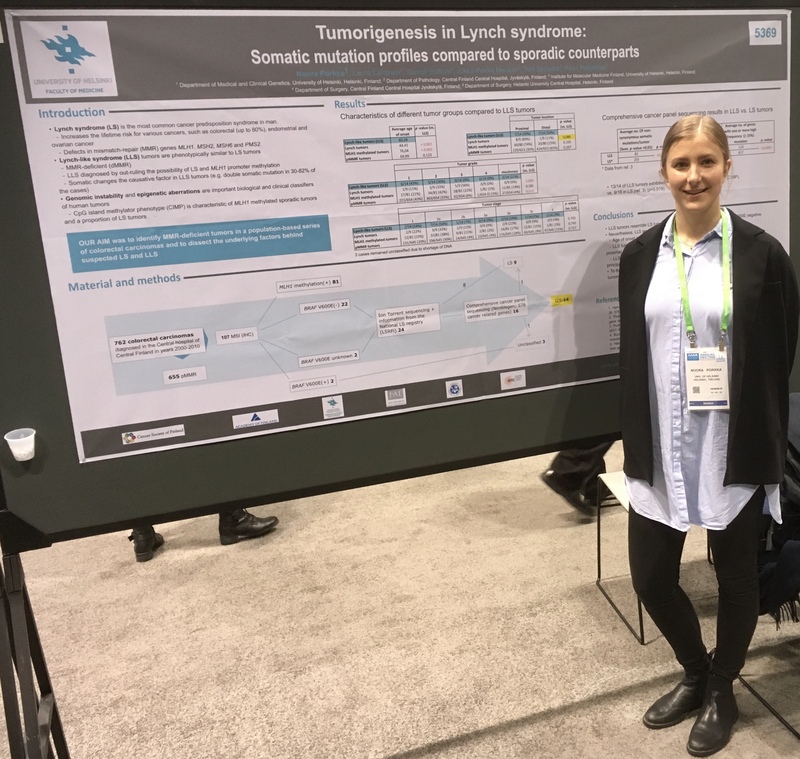 Noora Porkka, M.Sc and Satu Mäki-Nevala, PhD, presented projects related to epigenetic and genetic characterization of Lynch and Lynch-like syndrome cancer. 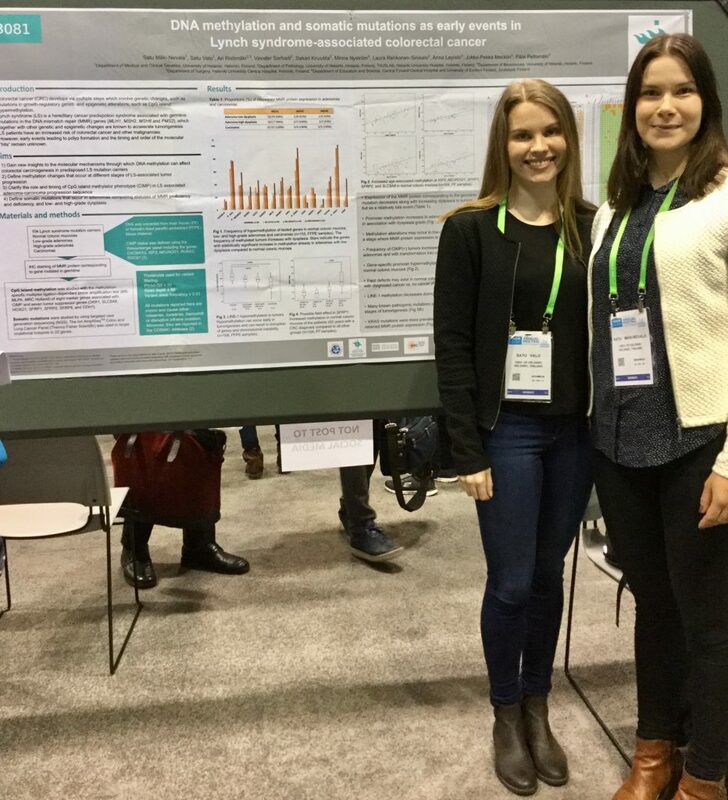 Minttu Kansikas, PhD, and Marjaana Pussila, PhD, from Prof. Minna Nyströms lab presented on-going projects related to the development and validation of a non-invasive test to detect Lynch syndrome (http://www.lscancerdiag.com/) and assessment of the effects of MLH1 gene deficiency in normal colon mucosa on colon cancer chromosome stability. Mlh1 deficiency in normal mouse colon mucosa associates with chromosomally unstable colon cancer. Pussila M, Törönen P, Einarsdottir E, Katayama S, Krjutškov K, Holm L, Kere J, Peltomäki P, Mäkinen MJ, Linden J, Nyström M.
Colorectal cancer (CRC) genome is unstable and different types of instabilities, such as chromosomal instability (CIN) and microsatellite instability (MSI) are thought to reflect distinct cancer initiating mechanisms. Although 85% of sporadic CRC reveal CIN, 15% reveal mismatch repair (MMR) malfunction and MSI, the hallmarks of Lynch syndrome with inherited heterozygous germline mutations in MMR genes. Our study was designed to comprehensively follow genome-wide expression changes and their implications during colon tumorigenesis. We conducted a long-term feeding experiment in the mouse to address expression changes arising in histologically normal colonic mucosa as putative cancer preceding events, and the effect of inherited predisposition (Mlh1+/-) and Western-style diet (WD) on those. During the 21-month experiment, carcinomas developed mainly in WD-fed mice and were evenly distributed between genotypes. Unexpectedly, the heterozygote (B6.129-Mlh1tm1Rak) mice did not show MSI in their CRCs. Instead, both wildtype and heterozygote CRC mice showed a distinct mRNA expression profile and shortage of several chromosomal segregation gene-specific transcripts (Mlh1, Bub1, Mis18a, Tpx2, Rad9a, Pms2, Cenpe, Ncapd3, Odf2 and Dclre1b) in their colon mucosa, as well as an increased mitotic activity and abundant numbers of unbalanced/atypical mitoses in tumours. Our genome-wide expression profiling experiment demonstrates that cancer preceding changes are already seen in histologically normal colon mucosa and that decreased expressions of Mlh1 and other chromosomal segregation genes may form a field-defect in mucosa, which trigger MMR-proficient, chromosomally unstable CRC. Niskakoski A, Pasanen A, Porkka N, Eldfors S, Lassus H, Renkonen-Sinisalo L, Kaur S, Mecklin JP, Bützow R, Peltomäki P.
OBJECTIVE: The diagnosis of carcinoma in both the uterus and the ovary simultaneously is not uncommon and raises the question of synchronous primaries vs. metastatic disease. Targeted sequencing of sporadic synchronous endometrial and ovarian carcinomas has shown that such tumors are clonally related and thus represent metastatic disease from one site to the other. Our purpose was to investigate whether or not the same applies to Lynch syndrome (LS), in which synchronous cancers of the gynecological tract are twice as frequent as in sporadic cases, reflecting inherited defects in DNA mismatch repair (MMR). METHODS: MMR gene mutation carriers with endometrial or ovarian carcinoma or endometrial hyperplasia were identified from a nationwide registry. Endometrial (n = 35) and ovarian carcinomas (n = 23), including 13 synchronous carcinoma pairs, were collected as well as endometrial hyperplasias (n = 56) and normal endometria (n = 99) from a surveillance program over two decades. All samples were studied for MMR status, ARID1A and L1CAM protein expression and tumor suppressor gene promoter methylation, and synchronous carcinomas additionally for somatic mutation profiles of 578 cancer-relevant genes. RESULTS: Synchronous carcinomas were molecularly concordant in all cases. Prior or concurrent complex (but not simple) endometrial hyperplasias showed a high degree of concordance with endometrial or ovarian carcinoma as the endpoint lesion. CONCLUSIONS: Our investigation suggests shared origins for synchronous endometrial and ovarian carcinomas in LS, in analogy to sporadic cases. The similar degrees of concordance between complex hyperplasias and endometrial vs. ovarian carcinoma highlight converging pathways for endometrial and ovarian tumorigenesis overall. 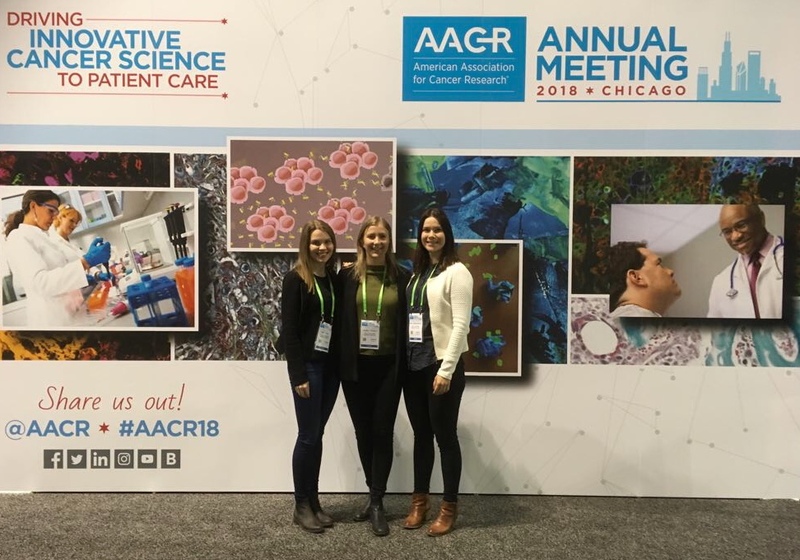 The annual AACR meeting was organized in Chicago, USA in April 14th-18th. 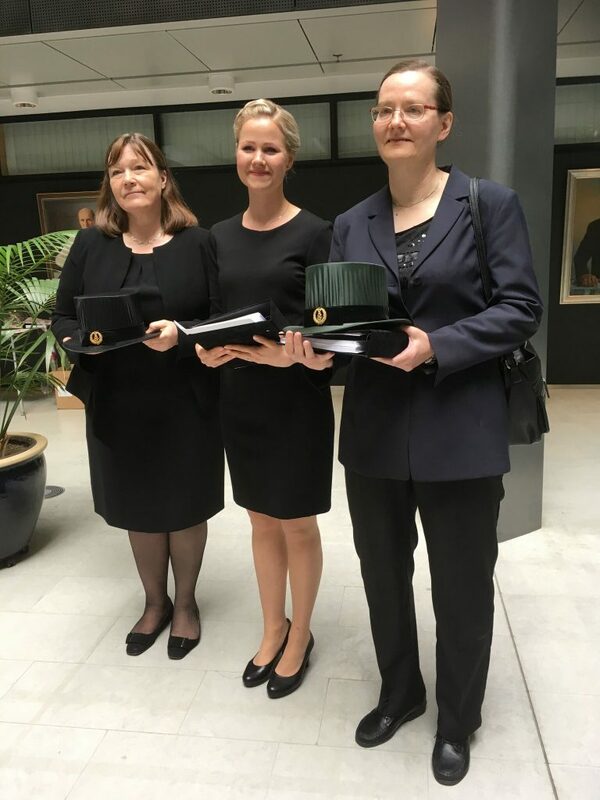 The Finnish Society of Medical Genetics (Suomen lääketieteellisen genetiikan yhdistys ry., SLGY) awarded the award for young researchers for M.Sc Anni Niskakoski from Prof. Päivi Peltomäki’s group. She received the award based on her excellent talk, entitled “Gynecological cancers in Lynch syndrome” in SLGY spring meeting in March the 23rd 2018.